It is important to get into the habit of quality conversations to strengthen the parent-child relationship, and prepare the foundation for effective communication during the difficult times that certainly will come. When you practice communication skills daily, you are establishing a routine that will assist you in problem solving with your child when an issue arises. With practice, even conversations about delicate topics will begin to feel more natural for you and your child. Show interest. Pay close attention when they discuss their interests. If they enjoy sports, keep up a conversation about the sports they like. If you do not know much about their interests, you can ask your child to teach you; feel free to ask questions. You might even do research on the topic so you are more knowledgeable about it. Make an effort to remember information your child has shared with you that seems important to him or her. Avoid too many questions, particularly at first. Expressions of positive regard or interest in your child’s world can be particularly helpful in getting a child to open up, especially at the beginning of conversations. You might start a conversation by just saying “Nice to see you!”, or commenting on how many books he brought home. Allow your child to direct at least some conversations. 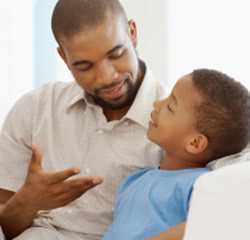 Make sure that each day you connect with your child about what is going on in your child’s life. Let your child tell you what is important. There will be other times where you will want to address a certain issue with your child. However, it is just as important to have conversations that are generated by your child. Give your child room to speak. Allow your child to verbalize their thoughts before commenting. Take a deep breath and listen. When your child pauses, even a nod of the head or an “Okay” will encourage your child to continue to share their thoughts and feelings. Demonstrate that you are listening. You can show that you are listening by stopping your own activity and moving down to be physically at their level. Make eye contact. Briefly summarize what you hear your child saying. After your summary, you might add the phrase, “Did I get it right?” and give your child the chance to clarify. This will demonstrate to your child that you take their thoughts and feelings seriously, and your child will more likely feel cared about and understood. Acknowledge your child’s feelings. Show your child that you can understand how they are feeling. Put yourself in their shoes. Try stating the emotion they are feeling. You might comment, “Wow, that must make you feel really angry,” or “It sounds like you are feeling disappointed, is that right?” When you acknowledge your child’s emotions in this way, they will feel better understood, and will likely feel that their problems are more bearable. In addition, when you show that you take your child’s feelings seriously, he is more likely to listen to yours. When you practice these skills on an everyday basis, your child will find it easier to talk to you, and will be more likely to come to you when they are facing difficulties, either to gain advice or just to feel supported. The more you practice holding quality conversations, the easier it will be to communicate with your child as they move through adolescence and young adulthood. Practice your skills daily to nurture the connection between you and your child and show that you are the support they can call on in a time of need.